Ah Sing Den is a true hidden gem in Austin. Ever since my first visit a few months ago I have been telling everyone who asks me for a recommendation in Austin to go here. Not only is the food AMAZING but the decor is absolutely gorgeous. The location is named after one of the world’s most famous opium dens in East London (from the Victorian times) and the creative, old world glamour vibe definitely comes through. Their cocktails are beautifully crafted with unique flavor profiles and they even have Baijiu and Shochu - Asian liquors that I’ve rarely seen on menus in the U.S. Plus, they have bottomless blood orange mimosas on Saturdays and Sundays! In addition to their amazing drinks, the food is really top notch. I’ve been for both brunch and dinner and what I like about going for brunch is that their full menu is available in addition to their brunch specials - so you have plenty of options! This dish is from the brunch menu and is one of the most unique brunch dishes I’ve had. The tempeh sausage was baked inside the warm bun, drizzled in beer cheese, and then topped with a sunny egg - so good! This dish is by far the largest serving of poké nachos I’ve ever had. Literally…a mountain of wonton chips topped with poke and avocado. I’ve ordered this every time I’ve visited! Goat Cheese Rangoons are the dish I never knew I needed in my life. 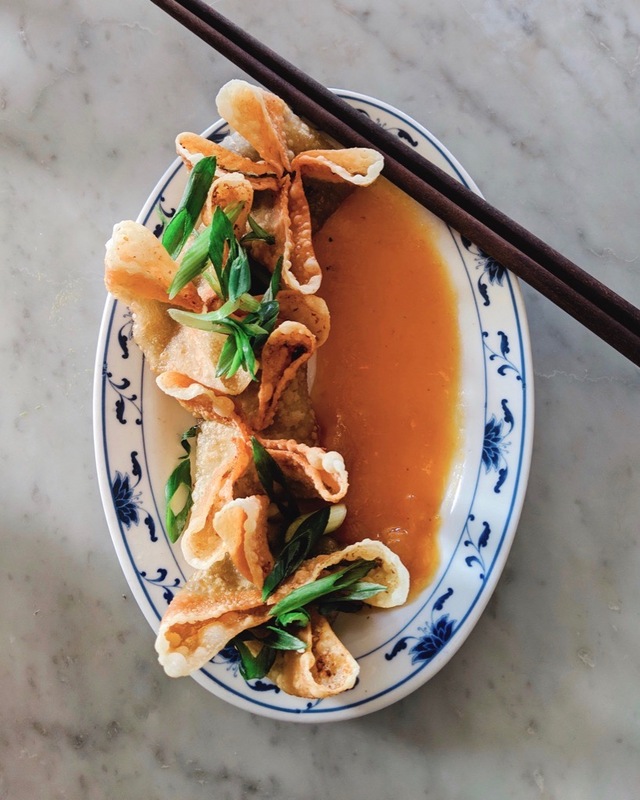 Crab Rangoons have long been one of my favorite dishes at Chinese restaurants and I absolutely love this elevated twist on the dish. Who doesn’t love a good potsticker?! I’ve had both versions of these potstickers and they do not disappoint! This. broth. is. INSANE. There was so much flavor and I was slurping it from the bowl!